tl;dr version: Free two-year renewable SSL server certificates! CAcert is an alternative to the commercial certificate authorities (CAs), allowing users to create free SSL certificates signed by a trusted CA. We plan to have an Assurance event at our May kw.pm meeting, Thursday the 19th of May at 7pm. Come out, learn about CAcert, and we expect that we'll have enough "assurers" present to get you started (able to make certificates; and build the web of trust by assuring others). To receive assurance points at the meeting, please visit CAcert.org and make yourself an account, tied to an email address you will use to receive assurances at the meeting. Also please bring two forms of government issued photo ID; such as provincial health card, passport, driver's licence, etc. (Your ID will just be reviewed, not recorded). Optionally, bring a laptop and you can follow along to install the CAcert root certificates in your browsers, and log into CAcert.org to review your status along the way to being an assurer. Put your name on the PizzaList for free pizza (sponsored by an anonymous rotating donor). CAcert separates assurance (confirmation of identity) from the issuing of the certificates. Thereby the identity only has to be confirmed once to make as many certificates as needed and whenever wanted. CAcert is a "non-profit" community of volunteers. It is independent from commercial CAs. Some CAs issue free certs, and some use a Web of Trust, but they tend to only issue low-level client certificates, but no server certificates or strongly verified certs. These free certs are intended to drive you to their CA so they can sell you higher value products. There is nothing wrong with that (your supermarket does the same thing) but it might not be appropriate to your needs. It's important to get a good network of trust built up. The more people you have who have assured your identity the better. The Kitchener/Waterloo area has only a few registered assurers. At this meeting, we can at least double the number of assurers, putting us roughly on par with Toronto's count of assurers!... And thereby growing the global web-of-trust. This meeting will be held at 7pm in MC 5158, in the Math Building. Here's a map. If you're driving, the recommended parking is in Lot N, $3 pay-and-display. From Lot N, it's a short walk along the Ring Road to DC then a right onto the service road to MC. 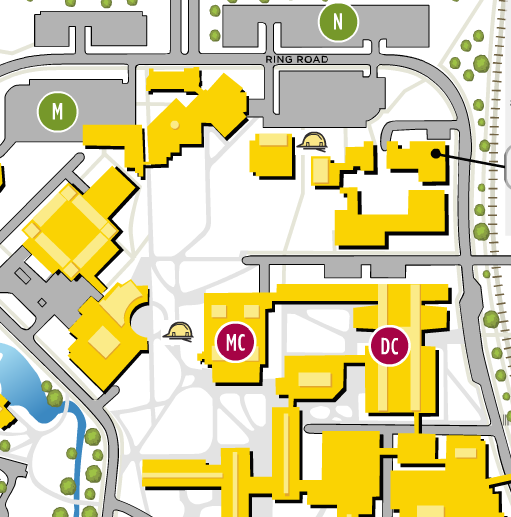 (There is construction blocking some paths on campus, marked as hard-hats on the map above). Hope to see you on Thursday the 19th!